I might be just a tiny yeti now, but I’m drinking milk! A new monster who will be a King Kong analogue, sort of, and more giant robot action as Red Ronin returns. 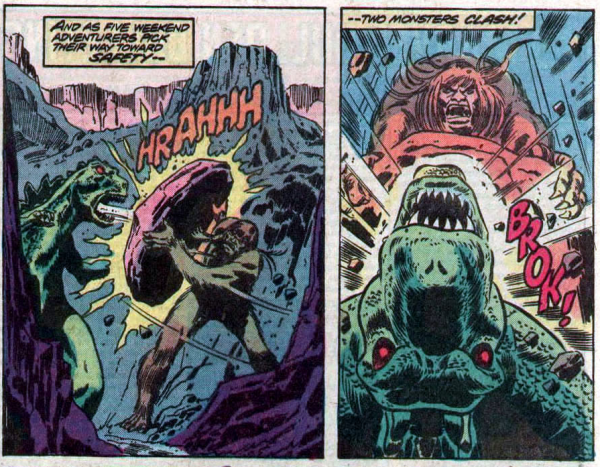 Yes, it’s more Marvel Godzilla comic fun! If you need a reminder of the cast, stop by the Godzilla Marvel Splash Page, and check in on everything with March of Godzilla 2013! Godzilla is a big fan of Butch Cassidy and the Sundance Kid! 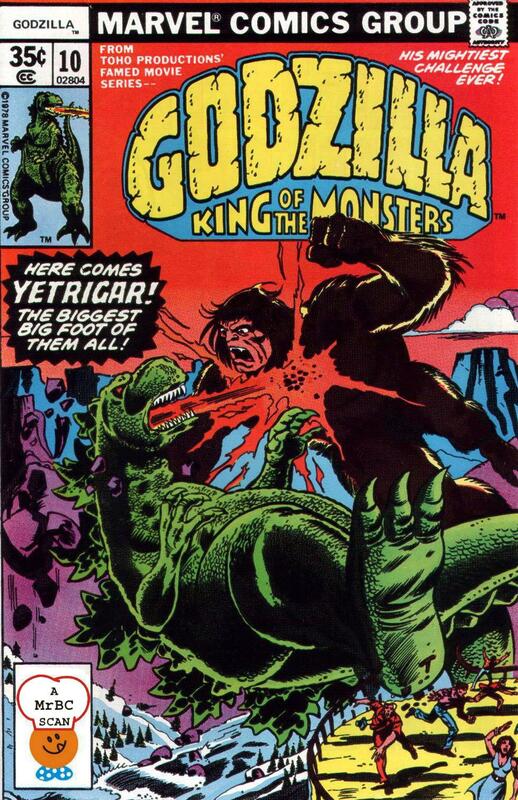 In the deserts near Arizona, Godzilla wanders near a nuclear test area, where an underground blast a few months back somehow traveled via underground caves to Alberta, Canada, and a frozen Yeti-caveman was thawed out and irradiated so he grew huge. This is an actual origin story, folks. The now gigantic Yeti-caveman then wandered all the way back to the desert nuclear blast site without anyone noticing. Yetrigar tosses a giant rock at the Behemoth carrier, which promptly crashes. D’oh! 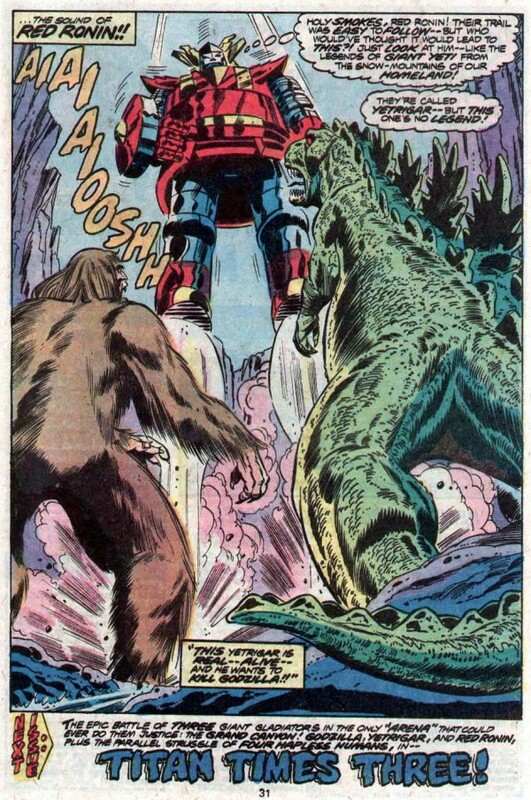 Soon Godzilla and Yetrigar battle at the Grand Canyon. It is the grandest fight the canyon has ever seen since Pecos Bill and Teddy Roosevelt exchanged fisticuffs. Robert steals Red Ronin again while Jimmy Woo and Tamara Hasioka are making googly eyes at each other. Can’t anyone take the keys out of Red Ronin and keep them in their pockets or something?? This robot is easier to steal than candy from a sleeping baby. Robert in Red Ronin flies to Godzilla’s location, and sees him battling the mosnter. 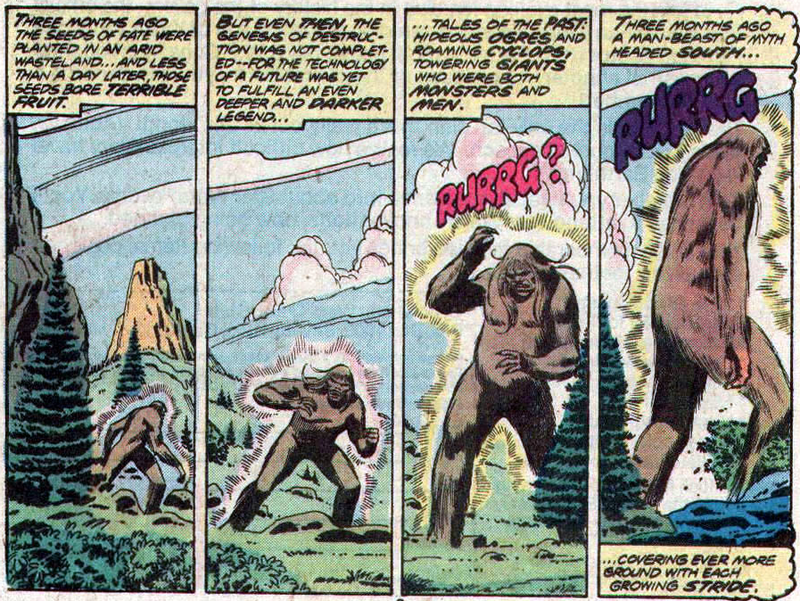 Robert claims yetrigar are a giant yeti legend from Japan, and thus we now have a name for the new monster. 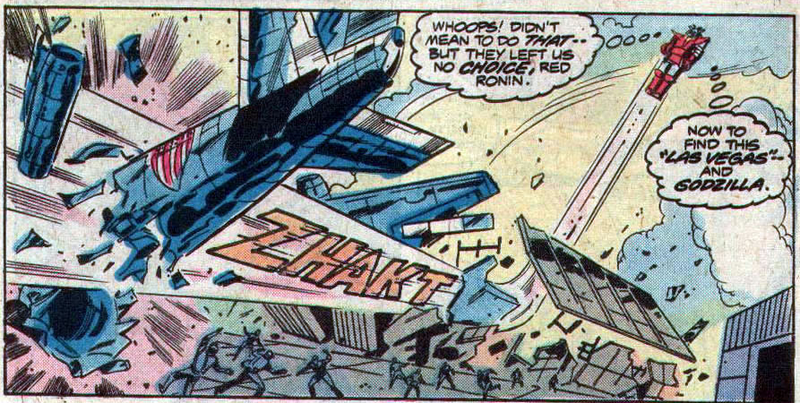 Red Ronin soon pops up in the middle of their battle, turning it into a three-way brawl. At least, it will be so, next issue! Until then, we gotta wait. And wait. And wait! Thanks goodness this isn’t 35 years ago and I already have the next issue! Yetrigar goes all Captain America! The heroes get sucker punched all the time in this comic! Oops! Our young hero kills dozens stealing a military weapon again! Once again, the comic promises actual action next issue!